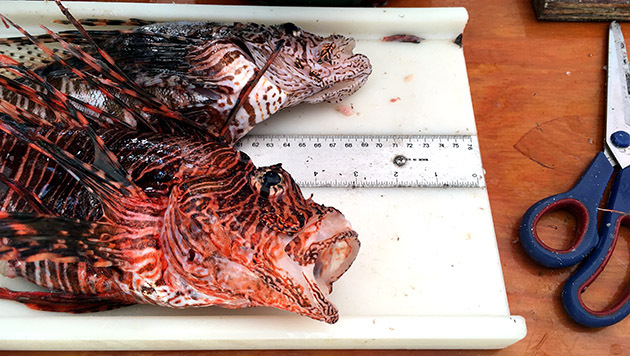 While processing samples, BIOS researcher, Gretchen Goodbody-Gringley came across a lionfish that had recently consumed a damselfish about 4-inches (10-centimeters) in length. Photo by Gretchen Goodbody-Gringley. Lionfish are known for their voracious appetite: individuals can consume up to 90 percent of their body weight every day and they prey on more than 100 fish species, including many that are commercially and ecologically important. In areas hard-hit by the lionfish invasion, such as Bermuda and Florida, efforts to control the population are relying not just on removing lionfish from the ecosystem, but on cultivating a human appetite for lionfish cuisine. On July 22, the 7th annual Groundswell Lionfish Tournament was held at BIOS. Under the theme “Eat ‘em to Beat ‘em,” the event combined a competition to catch the most—and largest—lionfish with a public venue that encouraged attendees to learn more about this growing ecological problem. 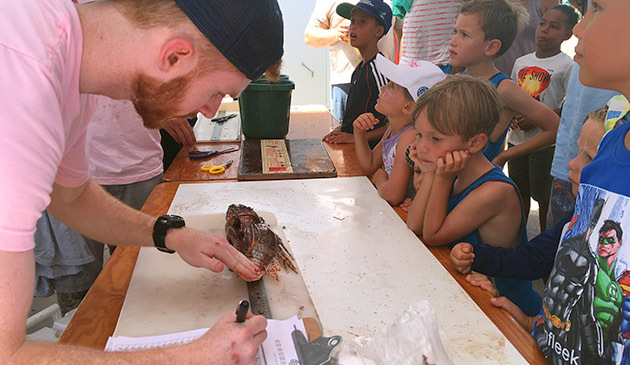 Young visitors watch as the lionfish are weighed, measured, and processed for samples, such as fin clips and gut contents. 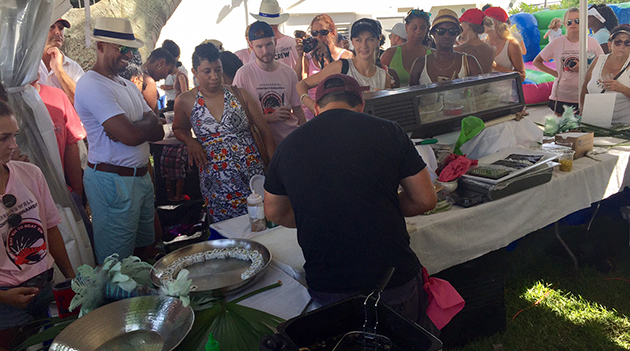 For many participants, the biggest draw was an opportunity to sample fresh lionfish prepared by local chefs. This year, Executive Chef Jason Berwick, from Devil’s Isle Restaurant, served up a variety of sushi including lionfish tempura maki with cucumber and teriyaki sauce, lionfish nigiri, and spicy lionfish maki. Executive Chef Jason Berwick, from Devil’s Isle Restaurant, served up a variety of sushi including lionfish tempura maki with cucumber and teriyaki sauce, lionfish nigiri, and spicy lionfish maki. Robert Steinhoff, part of the Advisory Committee of the Ocean Support Foundation (which was organized to support lionfish control and removal efforts in Bermuda) caught the largest lionfish of the tournament with a 17.5-inch (44.45 centimeter) individual. Team Dive Bermuda caught the most lionfish using traditional SCUBA, with 16 fish in the bag, while the Ocean Support Foundation’s technical diving team captured 26 fish. Another unique aspect of the Groundswell Lionfish Tournament is the ongoing growing partnership with local scientists—including BIOS reef ecologist Gretchen Goodbody-Gringley—who are studying various aspects of lionfish ecology, reproduction, and distribution. 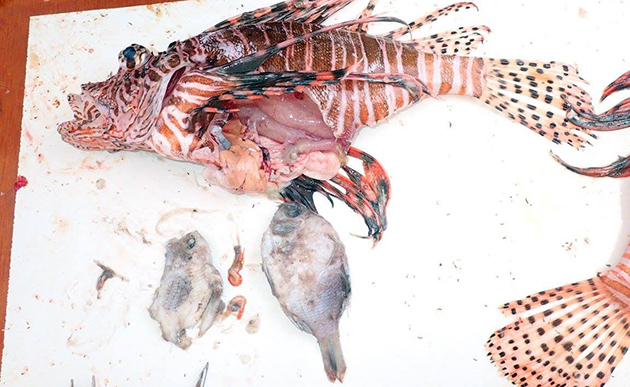 After the lionfish were removed from fishing boats and before they were cooked and served, each fish was weighed, measured, and processed for samples, such as fin clips and gut contents. These data are used to inform a variety of research projects, making the annual tournament an important source of lionfish data. While processing samples, Goodbody-Gringley came across an individual that had recently consumed a damselfish about 4-inches (10-centimeters) in length. For more information on the tournament, including results and photos: http://www.royalgazette.com/environment/article/20170722/lionfish-tournament-roaring-success. For more information on Groundswell, www.reefspect.com.